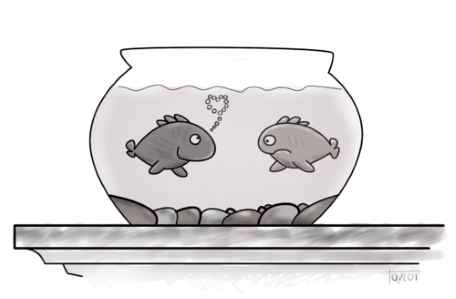 This article shows you how to take an existing cartoon or other image, and create your own version in Photoshop that you can adapt, modify and improve for yourself! 1. Scan a cartoon, photograph or download your favorite image from the Internet (presuming you will not be selling or distributing the resulting work). You can use the sample below if you like, just right-click on and select "Save Picture as..." in the popup menu that appears. 2. 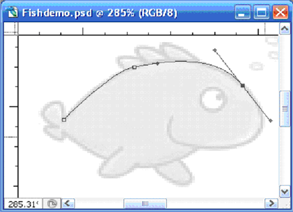 Make a new blank file in Photoshop (or any other image editing program that supports Bezier curves). 3. Use 5 inches x 7 inches at 300 dpi as a good starting point for a cartoon. 4. 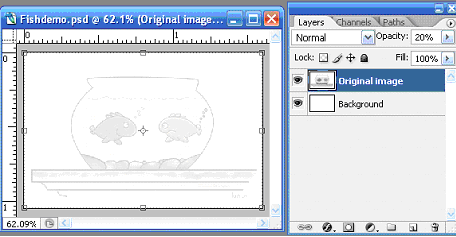 Place the image you wish to copy on a new layer (above a white background layer). In this example, the layer was renamed "Original image". 5. Change the opacity of this layer to 20 percent or so. This will "gray out" the image making your new copy lines easier to see. 6. Zoom in so you can see the appropriate level of detail and place the cursor where you want. It does not matter how fuzzy the original might be, since you are creating your own new artwork and just using the original image as a guide. However, if your original is very tiny, you may want to rescale it before you copy (use Image|Size with "Resample" checked).